Not all eyeballs are created equal. Image credits E. Caves, N. Brandley, S. Johnsen , 2018, Trends in Ecology and Evolution. If seeing is believing, humans probably believe a lot more than other animals, according to new research from Duke University. Our eyes perceive the world in much sharper detail than those of most other members of the animal kingdom, the results suggest. 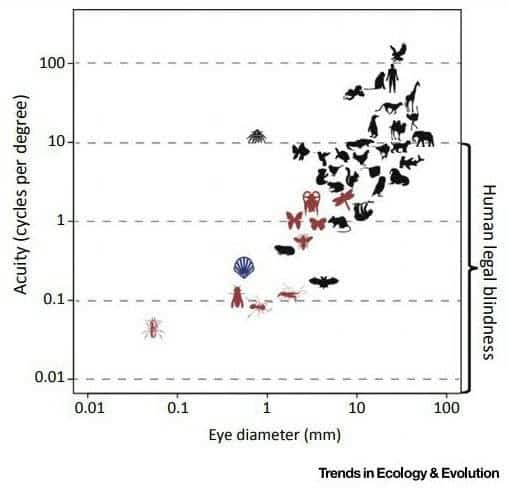 The researchers measured the visual sharpness of several species using a method called ‘cycles per degree’. Basically, what this method ascertains is how many pairs of parallel black and white lines an eye can distinguish in a single degree of vision. The human eye, the team writes, can resolve around 60 cycles per degree. Anything above 60 line pairs starts to look a blurry grey to us. Image credits Image credits E. Caves, N. Brandley, S. Johnsen , 2018, Trends in Ecology and Evolution. The team writes that chimps and other primates see roughly as well as we do. That’s not very surprising, given that they’re our closest living relatives. There are a few species that can boast higher visual acuity than us — the team notes that some birds of prey, such as the Australian wedge-tailed eagle with 140 cycles per degree, can see nearly two times more detail than we do. Given that they need to spot small prey from thousands of meters away, that’s not very surprising. Apart from these, however, we humans seem to have quite good eyesight. Fish and most birds, the team reports, can only distinguish about 30 cycles per degree. Elephants can only see a paltry 10 — which is actually the level at which a human is declared legally blind. The team believes that this behavior isn’t meant to communicate anything to other cleaner shrimp — it’s meant to signal fish: “both [the shrimps’] colour patterns and antennae are visible to fish viewers of various acuities from a distance of at least 10 cm,” they write. They make a similar point about butterflies. Based on the team’s results, these animals probably can’t even distinguish each other’s patterns. Birds, however, can. “The point is that researchers who study animal interactions shouldn’t assume that different species perceive detail the same way we do,” Caves concludes. 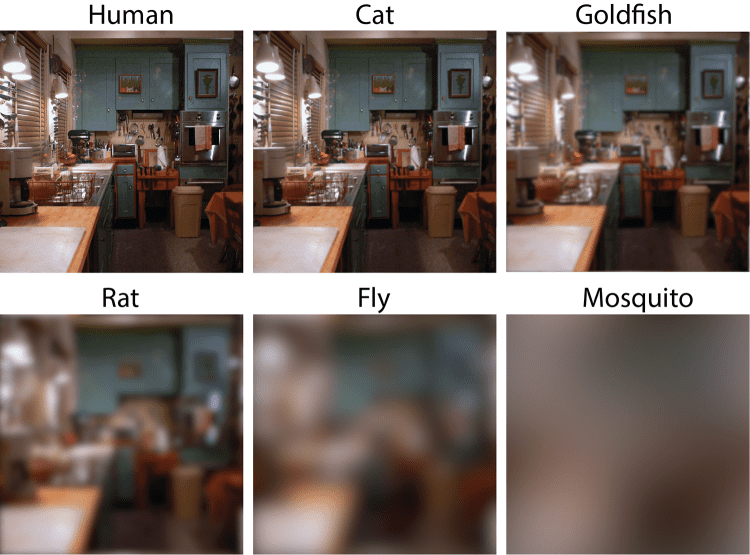 While I do find the findings fascinating, it’s important to note that animals may actually see better than their visual acuity alone suggests. The team’s research only focused on how their eyes work, but ‘seeing’ is mostly handled by the brain. It may very well be that these relatively dim-sighted species have neural systems in place to improve the final images they perceive. For now, we simply don’t know. Judging from the amount of data each species’ eyes records, however, it may be that we are some of the sharpest-eyed animals out there. The paper “Visual Acuity and the Evolution of Signals” has been published in the journal Cell.